Through our Aon colleagues in UK, we received a translation work from London Translations and were very pleased about the good work and also the perfect layout. We therefore used Aon Translations for the ﬁrst time out of Germany and have to say that although we were running a tight deadline, the service was excellent and in time. We will surely use London Translations again and will recommend their service in all our departments. Provided us with a superb service from beginning to end. We required a professional translation for an important presentation from English into French and after contacting many translation service companies, London Translations were by far the most professional. They provided us with a superb service from beginning to end. The translation they delivered to us was of a very high standard, within a time challenged frame and completed ahead of schedule exceeding all expectations. Your company's speed and efficiency in the translation of my documents and letters has made consultation with my Lithuanian colleague much easier than I could have imagined. The interpreter who attended was polite, professional and a credit to your company. You delivered right on time, and even in several different fonts which was a life saver. The promotion is on air right now and your stuff features in that and in the idents that run before each film. I think it looks fantastic. Domo Arigato! I would like to thank you and your team at London Translations Limited for the excellent service we have received in the past few months. The translations were turned around very quickly and were of very high quality. We value the personal approach and would be very happy to recommend your services to other companies. We were very impressed with the level of personal service we received and your company's commitment to meeting our deadlines even though we made several last minute additions and changes to the texts. I am writing to thank London Translations for you are your team’s impressively fast and accurate service you have provided to us over this year for your work project in Angola. The customer service is of an excellent quality of being personal, friendly and so professional. Our company will be using London Translations again in the future and would recommend them to others. My client needed this document translated as soon as possible and your company delivered it far sooner than I or he expected. In a world where great customer service has become a thing of the past, it's refreshing to see a company who still strives to be great. I cannot commend you and your company enough for the excellent work done. I can honestly say that your quick delivery and frequent communication, via telephone/ email, assured me that you would not fail to provide us with the translated text on time.Your level of service was most professional and I am very grateful that you could assist us with our request. I was really impressed with the way London Translations turned this around so quickly, and in such an efficient manner. The accuracy of the translation was also fantastic. I would like to thank London Translations for your assistance with translating several documents from English into Portuguese. London Translations was able to accommodate some of our requests at a very short notice. It showed a high level of ﬂexibility to meet our (often changing) needs. We've used your services repeatedly. In our opinion you offer good value for money. I would like to thank London Translations for a very fast, friendly and professional service. This was the first time that we had used your company and will be sure to use you again in the near future. When our business expanded into the Brazilian market, we needed accurate and contextual translations fast. London Translations provided a slick and efficient service from first contact to delivery of script. Very happy with the result, would highly recommend. From my initial enquiry, to receiving the translated document, it was dealt with efficiently and speedily. 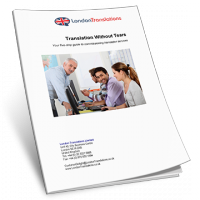 We were extremely pleased with the translation service provided by London Translations. They provided great value, efficiency and a fantastic finished product, for an urgent and last minute request. Always been professional, efficient, and provide excellent quality translations. I would happily recommend them for any translation needs a business or individual may have. All in all a very professional approach with a personal touch. Your team were flexible and always kept to deadlines (often at short notice). Impressively accurate translations to match our specialist brief. I would like to strongly recommend the friendly, efficient and speedy service of London Translations Ltd. I went to them with a rush job and a plea for a one-day turn around and they did it for me straight away, which was perfect. I would personally like to thank you for the technical translation work you undertook to be completed in a relatively short time. From the initial phone call we made to you a couple of days before New Year you immediately grasped what we needed. Alex Cazacu who looked after the Draper work at London Translations was very efficient in ensuring requirements were fulfilled on time and to budget. We have always found London Translations to be fast responding, accurate offering superb standard of service at a fair price. This was an urgent matter and you were extremely professional and very prompt to proceed and produce the finished article. We were very happy with the great service and this has been the case every time we have used your services. We often use London Translations and are very impressed with their service. They have a quick turnaround time, are flexible, reasonably priced and they worked with us to build an understanding of the industry terminology so we didn't lose time ensuring the translations used industry appropriate language. I would like to take this opportunity to thank you for the very efficient and friendly way in which you dealt with my enquiry. The translation was extremely accurate and confirmed my belief of its content. I will certainly use your services in the future should the need arise. AME Trade Ltd - a fast growing business to business event organiser in Africa, the Middle East and South America - has been a regular client of London Translations Limited. For English translation into Portuguese our point of contact is Project Manager Ms Marta Lorenzini. Ms Lorenzini has always been very prompt in communication and consistently delivered required translations before the deadline, even when it was very tight. I would like to thank you both for your outstanding customer service and the quick turnaround on all of my translation requests over the past few months. You always provide an initial estimate within 15 minutes which is greatly appreciated, as I am often working to tight deadlines. I am consistently impressed and delighted at how quickly I receive the translated documents! I am writing to thank you so very much for a job well done as over the past 12-18 months. Your professional services have been of the exacting quality and of the highest standard. We have been doing business with London Translations for few years now and we have never been let down by them. We deliver marketing communications in a variety of languages mainly mandarin and the service provided by London Translations enable us to do efficiently. They have been always punctual, accurate and professional. I found London Translations easy and efficient to work with and clear about was needed to keep the project running on time. I was extremely impressed with the speed and quality of your service and I will not hesitate to use London Translations again. I am very impressed with your prompt replies, pleasantness and the high level of service. I am sure that me and my colleagues will be in touch again soon! I am writing in relation to the above meeting we held at the Hilton Hotel - Paddington, where you provided us your interpretation services. I am just writing to thank you for the professional service you provided, which was invaluable to our meeting. 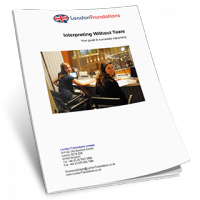 London Translations has always acted promptly and professionally when we require a translator or interpreter and our client has always been satisfied with the service provided. I would like to thank London Translations for the top level professional service provided. When we need urgent translation the work is always delivered on time, you have a very efficient team. I don't hesitate to recommend your company! I use London Translations Limited because I can rely on a fast and good quality service at a reasonable price and would therefore thoroughly recommend them. We wish to thank you all on behalf of Spaziolingue for the very good work you have done for us in the year 2013, especially for your help in transcribing and translating the videos from English to Simplified Chinese. We will not hesitate to recommend London Translation to other companies we work with. When I have requested services from London Translations it has always been fast and efficient. It makes a pleasant change to deal with a company that takes pride in providing a first class service. I have no problems at all recommending them. We used London Translations for four very important and urgent pieces of complex legal translation. We would highly recommend them for their quality of work. The speed of the turnaround was superb. The quality of the translation was unquestionable and without fault. I wanted to take this opportunity to thank you and your team for exceptional service. It is evident that London Translations always go beyond the call of duty. I am writing to thank London Translations for their impressively fast, accurate and well-priced translation services. We have no hesitation in using London Translations again in future and recommend your services with confidence. I just wanted to extend my thanks for your fantastic assistance with our interpreter requirements. I found your knowledge, expertise and the speed with which you answered my queries and actioned my requests to be of the highest level. The feedback about our interpreter was that she was excellent. We will definitely use the London-Translations services in the future. The translation itself is very good, accurate and in clear Russian language. Thank you for the excellent service and we are more than happy to recommend your company to others. Your team is always professional, quick, courteous, and obliging to assist. It is because of qualities such as these that we intend to continue using your services for all our future translation needs, and believe that you can only continue to assist us in easing the process of translating important documents. London Translations always supports our team with fast turn-around times and most importantly, very accurate translations. We come to you for all of our translating needs and will continue to do so. As relatively new clients of London Translations, we have been really impressed with the speed and efficiency of their work from the enquiry stage, right through to delivery. I can definitely recommend them! We want you to know that we are very pleased with the quality of service your company provides. We sincerely appreciate your responsiveness and the way you conduct business. We have recommended your company to others because of our satisfaction with your service. We look forward to doing business with you for years to come. Thank you for your excellent service. A fast, accurate and friendly service which far exceeded my expectations. I believe that good work should be praised and I am happy to confirm that London Translations provided a fast, accurate and friendly service which far exceeded my expectations. I had a web site translated from English to Chinese, it took just one day and the returned documents were in my preferred format and the translations to a very high quality. I could not have asked for a better experience and I will be using the service again in the future as finding good quality partners is always important in business — With London Translation I have found that partner. Thank you for all of your help in October when translating my recruitment advertising copy for a Head of E-Commerce role into both French & Spanish. I was very impressed with your fast turnaround. The timeframe was very tight and I was worried that I would not make the deadline but my contact at the company, Alex Cazacu, was very helpful and quick in his responses which put me at ease. I actually ended up receiving the translation earlier than expected. Alex Cazacu was extremely helpful and ensured that we received a quotation within an hour. A next day turnaround time was guaranteed and despite difficulties with public transport and traffic during the 2012 Olympics, London Translations delivered the certified translation to our offices before close of business the following day. Our company have been liaising with London Translation Services for over a month now on a near-daily basis as they have been assisting us with various Spanish translations for a major project. The prompt, professional and friendly service that I have received through using this service has ensured that the project has ran smoothly and quickly and we have, thanks to London Translation Services, met all of our deadlines. I am writing to thank you for your kind assistance in arranging for Christina to interpret at our conference yesterday at such short notice. Their service was eﬂicient, courteous and met a tight deadline for the documents we sent them. Indeed, we were so impressed that we will continue using them. This is a really easy letter to write. What an outstanding service I've just received from you! I think you turned the entire job around in about 2 hours from my first email enquiry - thank you and well done. London Translations Limited provided us With a speedy and efficent translation from English into Portugese. The translation was was supplied in our brochure format and we were very pleased with the end result. Would use their service again. We were absolutely delighted with the service we received. We were absolutely delighted with the service we received. Expertise in terms of account management and the actual translation was second-to-none. Our clients were extremely satisfied with the end product and this would not have been possible without the first-class support provided. The service provided by you and your colleagues in the London office was consistently intelligent, efficient and friendly. Your prices were also reasonable in comparison with other translation agencies. A service competitively priced from helpful and polite staff. I am continually amazed at the fast turnarounds they manage. I am certain to recommend London Translations every time as they provide me with the confidence I need when dealing with our overseas clients. Thanks so much for your help with our latest translation request. Turnaround time was excellent, as always, and everything achieved with quiet efficiency. Nothing was too much trouble – even when we asked for a quick turnaround she did her best to accommodate us, even exceeding the timeline set. We will definitely be using London Translation Limited again in the near future. London Translations were excellent in their support of our multi language corporate event in Berlin this December 2010. I was very impressed with the overall quality of your translation services. The matter was handled with utmost efficiency and in an excellent manner. I will certainly recommend you to my colleagues and look forward to working with you in the future. Always found them to be fast, friendly and efficient. We have been using London Translations for the past few months for a number of projects and have always found them to be fast, friendly and efficient. Regardless of the project or language required we get a quote same day and generally the work the next. The onsite team were fantastic! I just wanted to say a very big thank you for all of your help leading up to our event last week - it was very much appreciated. Please do pass on my thanks to the onsite team as they were fantastic!! We would sincerely like to thank you and your ream for the fantastic work during the BMW 5 Series Produce and Brand Experience 2010 in Lisbon/Portugal. Dealers from all over the world have experienced a successful event. This is also a result of the outstanding services and hard work that London Translations has provided during months of planning and several weeks onsite. May I express how impressed and satisfied I was with your service from beginning to end. As it was my first time using your company I must say I have been left with an excellent impression at the speed and level of service offered. I would not hesitate in using or recommending you again in the future. We are extremely pleased with the service received from London Translations Limited recently. We were running according to a tight deadline and your efficient service and timely delivery of translated materials made it achievable. London‐Translations.co.uk provided us with an absolutely superb service. The translations they provided were excellent, the speed in which they delivered was remarkable, and above all the communication was fantastic. It was fast, friendly, and frequent, I really couldn’t have asked for much more. On top of all that, it was a bit of a bargain too! Had occasion to use London Translations Limited and was extremely pleased with the service – very prompt, efficient and friendly – with regard to the translation itself and advice/production of artwork. I wouldn’t hesitate to use them again or recommend their services – a real delight to deal with! I wanted to let you know how happy I've been with the service that you have provided me. You provided an excellent service proof reading tens of thousands of words in Arabic. The work was accurate and delivered on time (even early in some cases!). Many thanks for the efficient and accurate work that was carried out for us here at Telford College in June 2009. Not only was the work produced at an extremely high standard but the cost of the package was very competitive also. On behalf of the team at Cohen Brown, I would like to express my sincere thanks to you and the rest of the team at London Translations for the outstanding service we have received with regards to the numerous translation projects we have given you to date. Often good feedback is harder to come-by than negative, and so I believe when a service has been provided that exceeds expectation, it is important to communicate gratitude, in any language! Having seen the accurate translation and typesetting of our Dutch instruction manuals completed to such a high standard, I have to say how impressed I am. We have several new areas of Worldwide business coming through and there is no doubt that your services will be used time and time again. I would like to thank you for your efficient and comprehensive translation and legal service you provided Leblas fine jewelry with. You made the whole process so simple and whoever we spoke to was extremely polite and knowledgeable. Both us and our client were very impressed with the speedy turnaround time as well as the quality. Your attention to detail and customer service is much appreciated and I wouldn’t hesitate to recommend your company to others.